Bitcoin Secures No. 1 Position In The Q4 Of 2017 On Newest Skills Index In U.S. According to the biggest worldwide freelancing website, Upwork, Bitcoin has managed to secure the No. 1 spot on newest skills index in the U.S. freelance market. 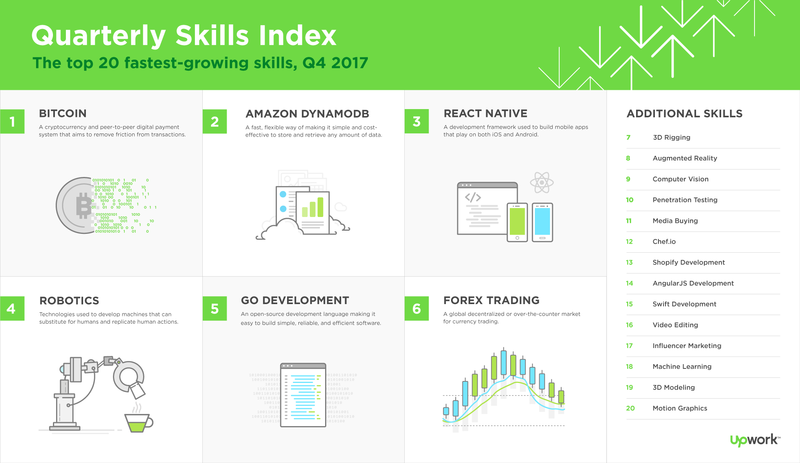 The craze for the cryptocurrency continues to evolve as Bitcoin takes over Forex Trading, Robotics, Augmented Reality, Video Editing and plenty other notable skills in the Upwork’s list of top 20 fastest growing skills index. In 2017, 57.3 million U.S. nationals (36% of the workforce) freelanced. The numbers are expected to grow immensely in next 10 years. In terms of year-over-year growth, the top 20 fastest growing skills experienced a surge of colossal 120% in the last quarter of 2017. Moreover, top 10 skills amplified by over 300% in comparison to the same period during the preceding year.